Colorado started the den 24 April 1977. The transmitter should deliver 50 watt, the official power, to a dipole on 24.2 meters. The station had their frequency on the 48 Mb, and after their first broadcast, from which they received letters from six different stations, they was not more heard. Not as Colorado anyway. 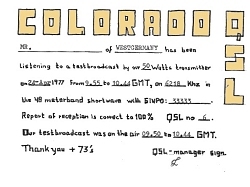 On the QSL you read Colorado and on all the other papers Coloradio. The reason for this was that Colarado was only a new test name of old East Coast Radio. The new name to come was Radio Domino-X.